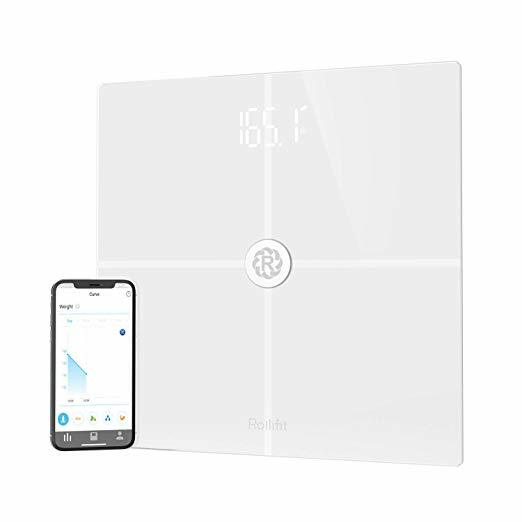 Rollifit is a digital body fat scale that uses bioelectrical impedance technology to provide a smart analysis of weight, BMI, BMR, Body Fat Percentage, Water, Muscle Mass, Bone Mass, & Visceral Fat. Using its 4 precision biometric sensors made of conductive tempered glass with step-on technology supporting weights up to 400lbs or 180kg. Includes Health tracking integration our iOS and Android app will sync data, monitor trends, provide health tips, and connect with fitness applications. One Scale & unlimited users make the Rollifit scale excellent for sharing in group environments, e.g., large families, gyms, & nutritionists office. 100% compatible with Fitbit, Google Fit, & is Bluetooth ready. 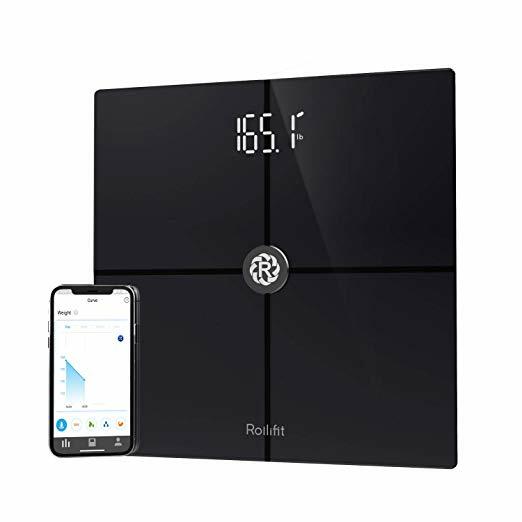 Rollifit is a digital body fat scale that uses bioelectrical impedance technology to provide a detailed analysis of weight, BMI, BMR, Body Fat Percentage, Water, Muscle Mass, Bone Mass, & Visceral Fat. 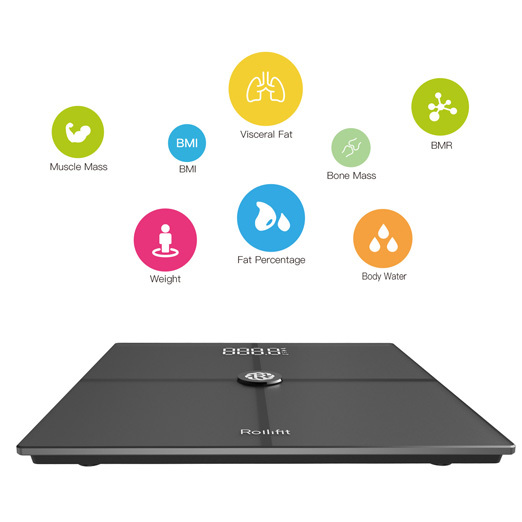 The scale has 4 precision sensors that ensure quick and accurate body measurements. Made of ITO conductive electrode with ultra-transparent tempered glass that provides a metal-less surface with higher sensitivity. One, download the app from the iOS or Android app store. Two, connect the Rollifit app via your phones Bluetooth. Three, step on the scale! 100% compatible with Fitbit, Google Fit, & is Bluetooth ready! 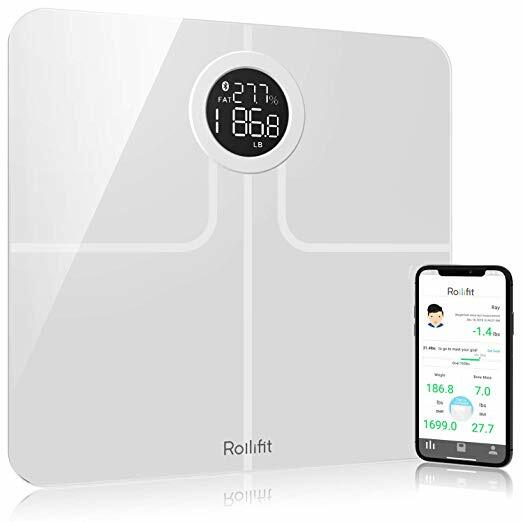 Rollifit Bluetooth Smart Scale allows you, your friends and family to share this device all together, simply download Rollifit App in Apple Store or Google Play, it will sync data, monitor trends and even provide health tips, gradually and constantly help you on the journey to fitness. Let us scale up your success together!